It’s widely agreed these days that inbound marketing is better than outbound marketing, with more and more brands making the switch from old school marketing techniques to newer ones. But does that mean we should completely forget about outbound? Traditional outbound marketing pushes products, services and messages onto people on the hope that they will resonate with them. New, inbound marketing is more about pulling people towards products, services and messages naturally, with quality content. At bandv, we favour the inbound marketing methodology. It is proven to bring in more leads and customers for less marketing spend, and is easier to track than outbound marketing. According to HubSpot's Ultimate List of Marketing Statistics, 44% of online shoppers begin by using a search engine, and SEO leads have a 14.6% close rate, while outbound leads (such as direct mail or print advertising) have a 1.7% close rate. However, there is something to be said for using outbound techniques, like ads and trade shows, together with inbound techniques; promoting and distributing valuable content but via these older channels. 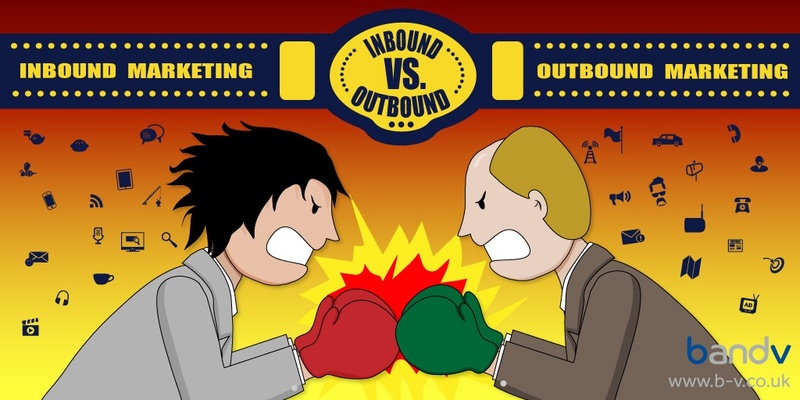 We still advocate putting more time and resources into the ‘long game’ of content marketing, SEO, PPC and social media as part of an inbound marketing strategy, but we recommend using inbound and outbound in tandem for the best of both worlds.